An ornate Tibetan-style metal incense burner with a vintage antique finish and decorated with motifs inspired by the Eight Auspicious Signs. Suitable for incense sticks, incense cones and loose or powder incense. 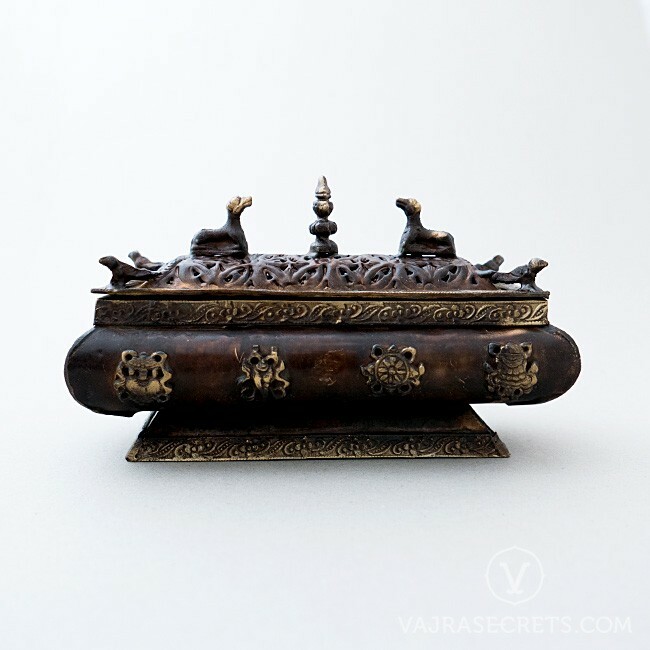 An ornate Tibetan-style metal incense burner with a vintage antique finish and decorated with motifs inspired by the Eight Auspicious Signs. 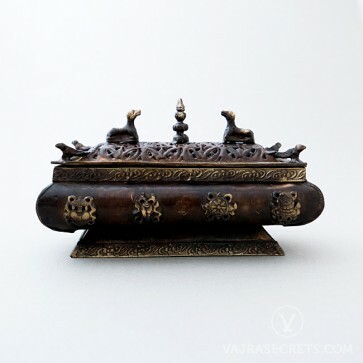 This box-style incense burner is best used with Tibetan incense sticks but can also be used to offer incense cones and loose or powder incense. The main receptacle sits on a raised base, offering protection against overheating and fire while the removable lid enables convenient access and easy cleaning. Carvings mask ventilation openings that enable the incense burner to be used covered or open. Light your favourite incense stick and place it on the bed of ash. A small quantity of powder or loose incense may also be sprinkled over the lit incense stick.